Another day has just flown right past me and i feel like I am in that film benny button because i feel my brain is dwindling away. I went to argos today to get play-sand for my sons exquisite masterpiece of a sandpit that i built lol. I felt a bit of an idiot as the only way i could get it to my car was by a sainsbury’s trolley so there I am walking through town with an empty trolley looking like some one from the funny farm and then having to push it back to my car and like all trolleys its got wonky wheels and i must have looked like a hippo on ice and i had to make TWO TRIPS! i needed a ventilator to get my breath back. It was all worth it in the end because Archie played in the sand all afternoon so it had a happy ending. Sue’s friend Lisa had her birthday yesterday and she wanted to make her something special as she has two young boys as well so she decided to make her a personalised necklace with the names of her two boys on it. We like the necklace that much we are going to start selling them on our site. Its not the best photo in the world put we hadn’t planed on taking one and sue was in a rush but it will do for now. So what we have is a very long snake chain with a handmade ring attached to it. 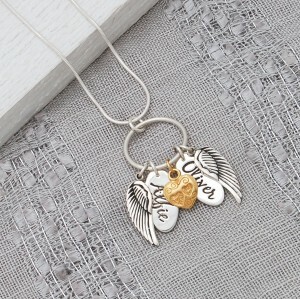 It then has two etched names with a gold vermeil heart between them and protected by angel wings on either side of the names such a beautiful looking piece. Ok that’s me for now I am very tired after my benny hill impression so bonne nuit. This entry was posted on Monday, August 2nd, 2010 at 10:06 pm	and is filed under Handmade Jewellery, Jewellery Inspiration, New Creations, personalised jewellery.